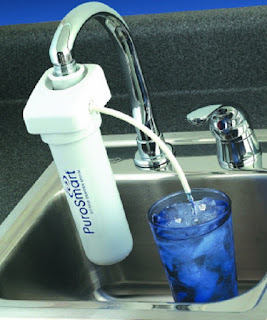 Balkowitsch Enterprises is offering the NEW Dr. Clark Purosmart Reverse Osmosis Faucet Mount Water Filter! The PuroSmart Faucet Mounted Reverse Osmosis System will produce up to 50 gallons per day. It is easy to use, just replace the aerator on your kitchen faucet with the one provided with the PuroSmart. To connect the system just press down on the white ring and push the system firmly on the faucet. A clicking sound lets you know the system is attached a ready to use. Be sure to flush out your PuroSmart for 2 hours prior to use. Once the PuroSmart has been throughly flushed, place a clean container in your sink and insert the tubing from the top side port of the system into your container. Simply turn on your faucet and your PuroSmart system will deliver high quality water for your entire family. We back every Dr. Clark product that we sell with our 100% money back guarantee. If you have any questions about this product please call (800)355-2956.